Description: Detailed large political map of Virginia showing cities, towns, county formations, roads highway, US highways and State routes. 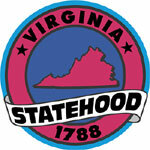 Virginia is a state in the United States and it is also referred to as the Old Dominion. Located on the Atlantic coast of the southern part of the country, Virginia is also referred to as Mother of Presidents, as it is the state where eight U.S presidents were born. The Blue Ridge Mountains influence the climate and geography of this state. Virginia Beach is the capital of Virginia and this city is has the highest number of this state’s population. There are about eight million residents in Virginia. It is the 35th largest state in terms of area and it has an area of about 110,784 square kilometers. On the east of Virginia there is the Washington, D.C; on its north there is Maryland; Tennessee and North Carolina is located on the south of this state; on its west there is Kentucky; on its east it faces the Atlantic Ocean and on its west and north it is surrounded by West Virginia. Of the various ethnic groups living in this state, the five main groups are American, African, English, German and Irish. Virginia is basically a state where most of its people are Protestants and Catholics. Buddhism, Judaism, Islam and Hinduism are also followed by some people. Physical map and map image of Virginia. Information and guide about Canada and website listing.